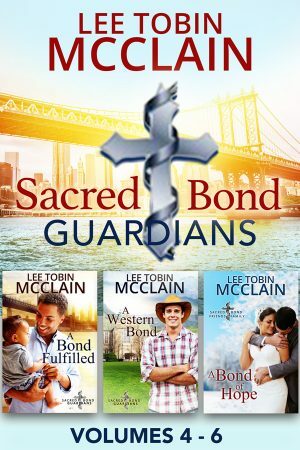 Get the final three Sacred Bond Guardians novels bundled together for the first time! Volumes 4-6 of the Sacred Bond Guardians series. If you’ve read the original Sacred Bond series, you know about the Covenant School, a private Christian reform school that’s the last stop for teenaged boys headed to juvie. A year after the original group of teen boys formed the Sacred Bond brotherhood, another group of boys helped save a vulnerable women and child from the predator intent on killing them. Under the mentorship of decorated war hero Chad Sager, these four boys formed the Sacred Bond Guardians, vowing to protect the weak by finding work in military or police fields. Bundled together for the first time: the story of the 4th brother, Hector; his wealthier friend Mark (who learned a shocking secret about himself in A Bond for the Holidays); and Maria’s friend Esperanza.